Not sure how to better phrase this. We all are familiar with the typical evolution of a software product. Once it is released, it gets enhanced over time - with major and minor releases providing new features, enhanced user experiences and sometimes also under-the-hood-changes to make using and/or deploying the product more efficient. Despite these changes: what used to be a product, keeps being a product. Well, it seems that Microsoft (the guys who have been playing a crucial role in in building and establishing the release cycle-way of a software product business) actually decided to change the rule of the game. Just taking a glimpse, all is as expected. The version number changed from 2015 to 2016, and some features have been added. But after taking a closer look, nothing is as expected. The complete entityMicrosoft Dynamics NAV has made a metamorphosis from version 2015 to 2016. What used to be a classical software product, now is a software service at the same time. The intriguing thing: it is neither a product nor service approach. It is a hybrid. A dual product and service approach. So, in my current "I am relaxed in the hotel lobby in Florida"-mood, I am tempted to call that thing a "prodvice". So? How does this impact us? There are two facets to this: (a) a business and (b) a technical facet. Seeing change coming (maybe not expecting it that fast ;-) and being a business person, I spent a lot of time dealing with (a) beforehand and aked myself if we as a company are prepared changing our business model from an on-prem perpetual license business to a business supporting a SaaS deployment and revenue recognition model. This had been positively answered and starting from a blank piece of paper and in a close dialogue with many partners, I sense we developed a good fitting SaaS pricelist for our visual scheduling add-ins which will be released to our partners when I am back home. 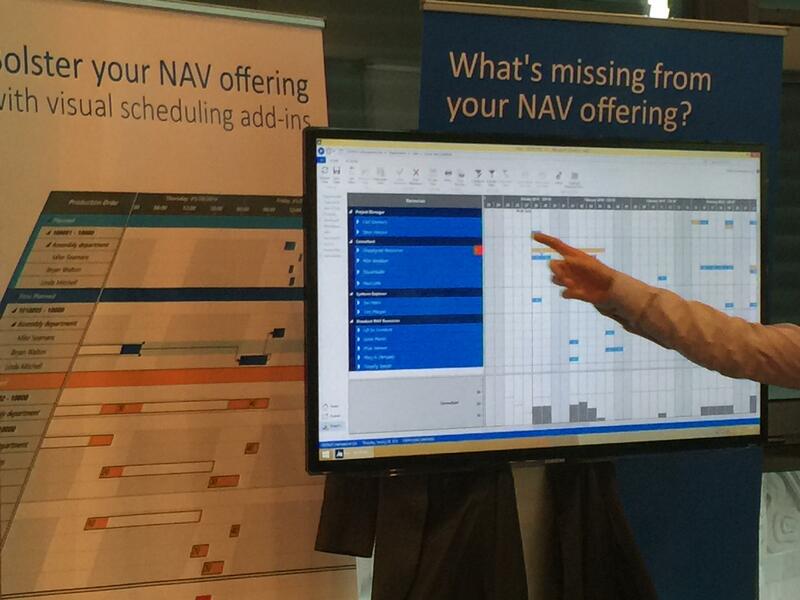 Now let's face the (b) technical impact of Dynamics NAV being a service. If we strip this down to its essence, a service means no version as we are used it, no release, no upgrades. Yes: all customers will always be on the ever current and gradually enhanced version of the same product; sorry: of the same service. This actually will have a huge impact on ISV solutions: if our partners will sell Dynamics NAV as a service, they will want to sell (and deploy) our visual scheduling add-ins as service as well. But, if they do not have to care for versioning, upgrading etc. for the ERP system, they will not want to take care for versioning, upgrading etc. the ISV add-ins. Well, I sense that we have to spend some time thinking on how to gain "service-ability" for our visual scheduling add-ins, which means how we can further enhance them so that they just fit into the Dynamics NAV service as they today fit into the Dynamics NAV product. Good news though: our add-ins are already designed to have a minimal footprint in NAV, not requiring any merge of objects and to be installed and up and running in less than 15 minutes. Disclaimer first: I did not hear an official and loud announcement. So, whereas take-away #1 deals with a lot of facts and evidences, this one is more of my own assessment. However, having observed the technology platform advances in the past few years, the metamorphosis from a product into a 'prodvice' as well as the introduction of the Dynamics NAV extensions this year, I sense that we are rather close to getting some kind of infrastructure that allows enriching the Dynamics NAV experience with some kind of third-party apps. Means: no longer external add-ons nor better integrated add-ins via the Client Extensibility Framework, but enhancement apps. The benefit of such an approach would be obvious: no - not at all any - change to the standard Dynamics NAV service enabling the partner to deploy a standardized service (maintained by Microsoft) and then enriching it by his own or by his partners' apps. I bet that this is the direction we are heading too. So: Is my add-in business on risk? 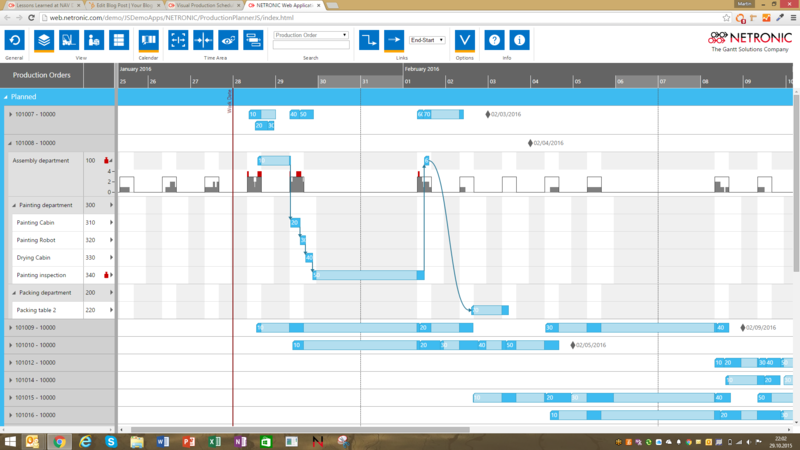 All in all, I am excited about the days, weeks and months ahead and am convinced that we will continue having a lot of fun with providing visual scheduling capabilities for Dynamics NAV. And this brings me to my third and final take-away. As happy as I am heading home now, it is kind of sad that we now have to wait almost another year before the Dnymics NAV community meets again. As in the past years, it was fun learning all this great content in many sessions, having so many great discussions at our booth about our visual scheduling products, meeting and catching-up with partners, getting to know new folks who might become valued partnes soon and also being invited to sit down with some of the Microsoft staff. In addition with a wonderful Oktoberfest and the night in the uncredible Harry Potter Diagon Alley made Directions for me what it should have been: hard work paired with big fun. 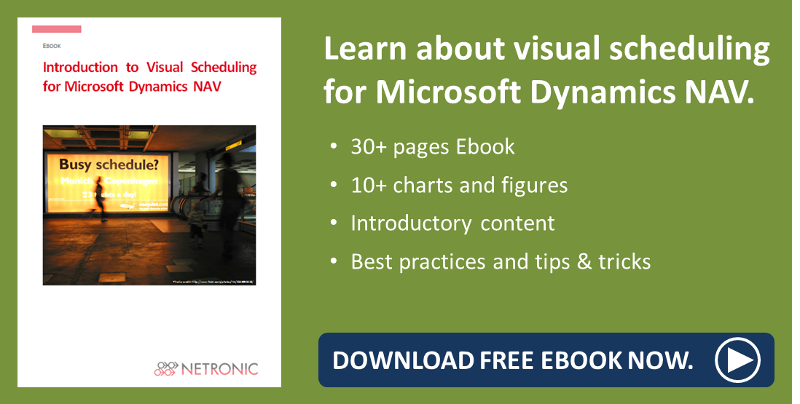 So if you wonder what I refer to when speaking about visual scheduling for Microsoft Dynamics NAV, please feel free to download the below complementary Ebook.